My name is Charles Roberts, published author of my pre-Beatles memoirs'Just Like Starting Over. I was raised in Liverpool where my personal encounters with JOHN LENNON and the QUARRYMEN began, and where I captured the very first photo's of John and the lads, two weeks prior to him meeting Paul. I still remain friends with Len Garry, Colin Hanton and Rod Davis, all original members of John Lennon's first group - the Quarrymen. 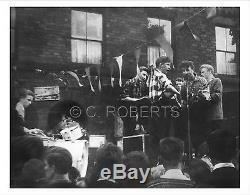 This is a set of the 3 surviving Rosebery Street Party photo's held on Saturday 22nd June 1957, and they are the very first of John Lennon and the Quarrymen playing live. 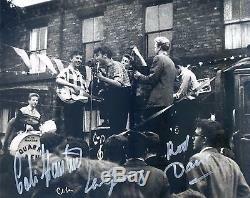 1 is hand signed by the 3 active Quarrymen. Colin Hanton, Len Garry and Rod Davis. 2 and 3 are signed by me, Charles Roberts, the photographer and teenage friend of John and the Quarrymen. The photos are 10"x 8" and 14"x 11" approx. For further info please read my individual listings. BEWARE OF CHEAP COPIES THAT ARE WORTH NOTHING. 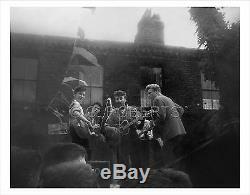 The item "JOHN LENNON and the QUARRYMEN SET of 3 FIRST EVER PRE- BEATLES PHOTO'S" is in sale since Thursday, August 10, 2017. This item is in the category "Music\Music Memorabilia\Artists/ Groups\The Beatles". The seller is "diondee123" and is located in Liverpool. This item can be shipped worldwide.